The limits to acceleration in greyhounds and horses can be related directly to those experienced by a motorcycle. At low speeds, there is a danger of pulling a wheelie; at high speeds, the power of the engines (in this case, the muscles) becomes limiting. 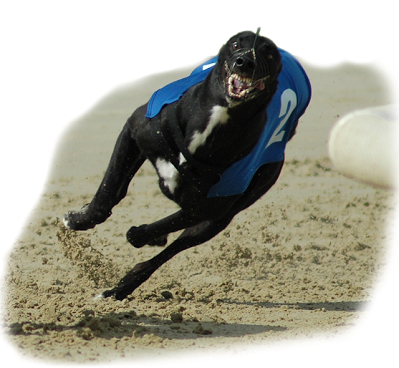 Accelerating Greyhounds and horses were measured by Sarah Williams and Huiling Tan. 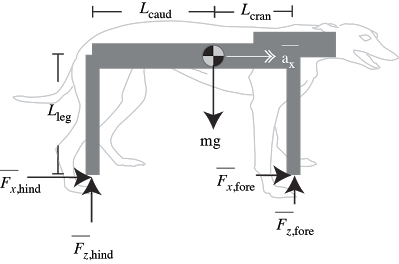 Consistent with the ‘wheelie-limit’ model, the relatively upright horse was limited to an acceleration of 0.6g, whereas the squatter greyhound achieved 1g. Greyhounds, unlike humans (see the ‘Running’ section) slow down very little when sprinting around a bend, withstanding an increase in effective weight of over 70%. How they are able to do this (are they like motorcycles? ), and whether this is capability of quadrupeds generally, remains one of my key research interests. To test that abilities of other sprinting animals under increased effective gravity (such as that experienced when bend-running), we are developing an animal centrifuge.